Yesterday was Friday again, which means it was our weekly cooking class with the kids! This week we had Mr. J with us once more, as he had been asking to be part of the class again since last week. Because of that, I decided to do something he’d like — and that meant chocolate. After looking through different ideas, I chose a brownie recipe from Abigail Johnson Dodge‘s recipe book “The Weekend Baker,” which I absolutely love. I bought this book about 10 years ago, when it first came out…. and I use it so frequently, it’s already coming apart! A super sweet and gooey chocolate brownie! Position oven rack on the middle rung of the oven. Preheat ti 350ºF. Lightly grease the bottom and sides of a square 8X8 or 2 qt. baking dish. Put the butter in a medium saucepan and set over medium heat, stirring occasionally, until the butter is melted. Slide the pan from the heat and add the cocoa powder. Whisk until the mixture is smooth. Add the sugar and salt and whisk until blended. Add the eggs, one at the time, whisking after each addition just until blended. Whisk in the vanilla with the second egg. Sprinkle the flour over the chocolate mixture and stir with a rubber spatula just until blended. Scrape the batter into the prepared baking dish and spread evenly. Scatter the topping over the batter, if using. 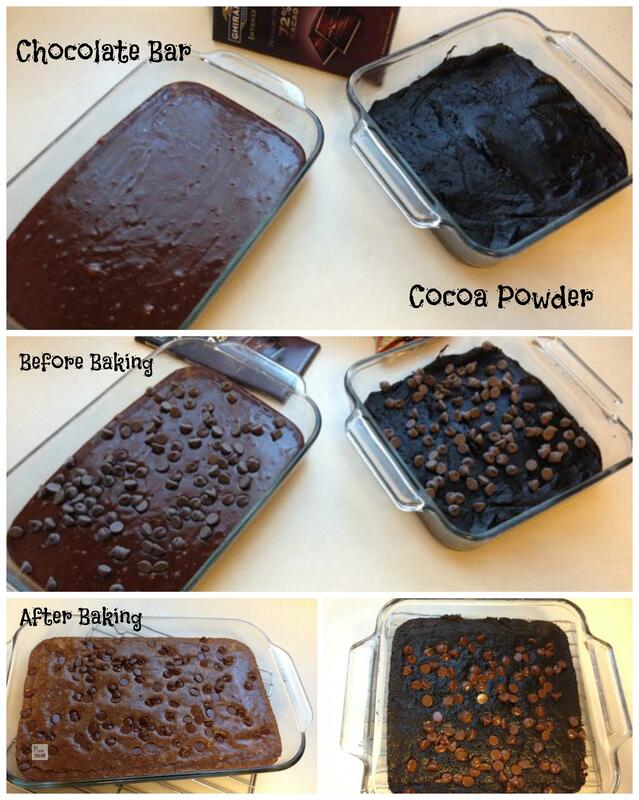 Bake until a toothpick or cake tester comes out with small, gooey clumps of brownie stuck to it, about 32 minutes. If you overbake, the brownies won't be fudgy. Transfer the baking dish to a rack to cool. Using a sharp knife, cut the cooled brownie into 3 equal pieces. If the brownie is still warm, it will be hard to cut cleanly. Wait until the brownie is cold and take out of the pan, otherwise it will be very hard to take out once it's cold. Doing this recipe with a chocolate bar, the only change is to melt the butter with the chocolate simultaneously, at low temperature and stirring constantly. What we also learned is that you need a lot less sugar. Probably between 1/2 a cup and 3/4 cup, depending on how dark is the chocolate you're using. Finally, use nuts to top, as the chocolate chips we used were too much for sure! The first difference we noticed with our experiment was the texture of the dough. 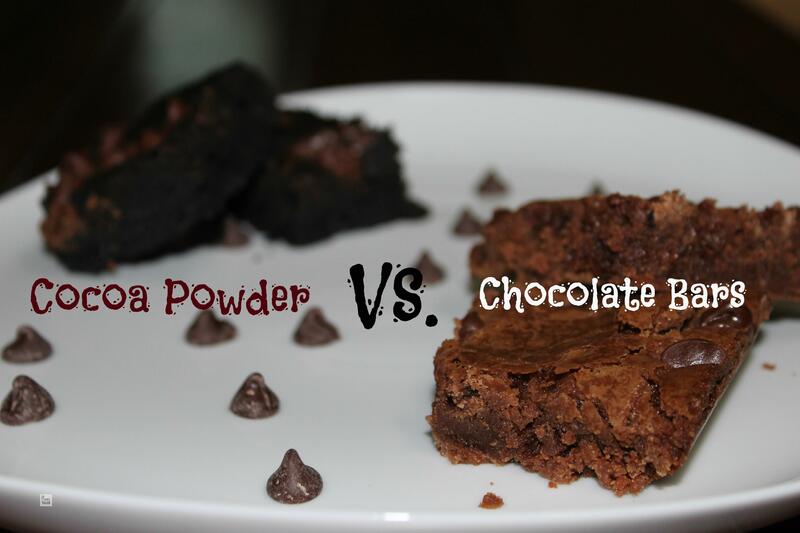 With the cocoa powder, the dough was tacky, while the chocolate bar made a very smooth dough closer to a cake batter. Once it was done, the texture and color of the chocolate bar dough looked a lot more appealing to the eye. It was really hard to keep the little ones in check for the brownies to cool enough! As soon as it was less hot, I cut them and put them in plates for them… they were still very gooey, but at least that way they would cool off a lot faster. Armed with forks and glasses of milk, they proceeded to attack the brownies, in order to give a verdict on which one was better. Little Miss I was in charge of the chocolate bar batter, so of course she said she liked that one best. Miss Z (in charge of the cocoa powder one), said she liked hers better. Mr. J said he liked both of them a lot, but he liked the cocoa powder one most (his words). Tiny A just happily munched on every single piece of chocolate that came his way. I did like the cocoa powder better too, despite the looks of it. The chocolate flavor of it was a lot fuller, and less sweet. My husband thought so too. I guess that if I were to do this brownies again with chocolate bars, I would definitely cut back on the amount of sugar for the batter, as well as use a nutty topping, instead of chocolate chips. 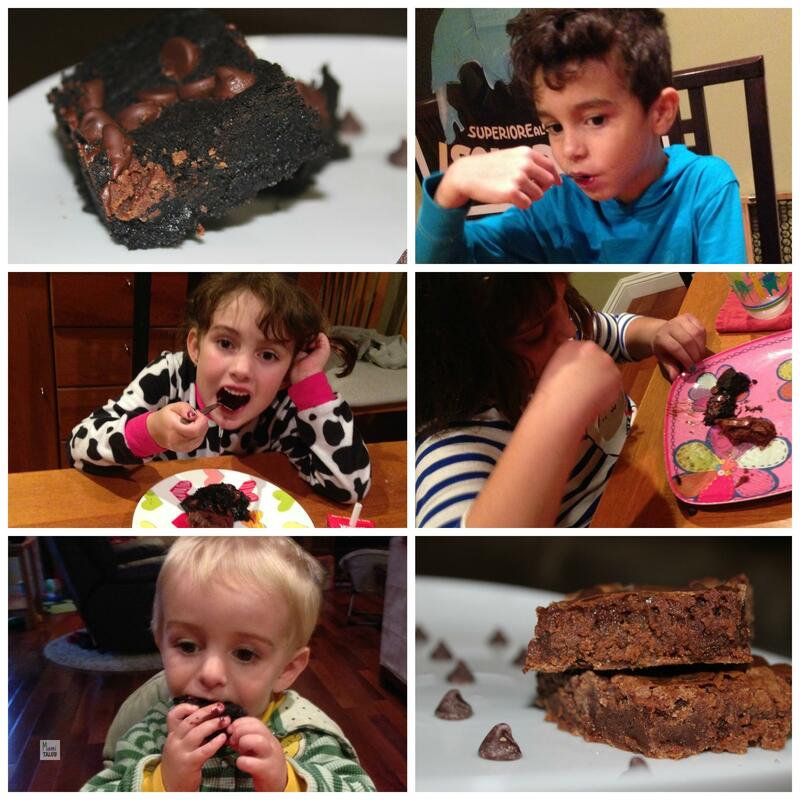 All in all, we enjoyed the experiment a lot, and now the kids know how to make very gooey packed-with-chocolate Brownies! Tagged Baking and Cooking, Cooking with Children, Desserts, Science for kids.